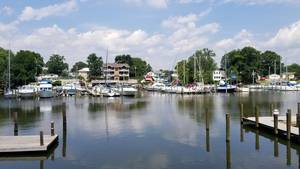 Essex Marina & Boat Sales is one of the largest boat brokerages in the northern Chesapeake Bay. With over twenty-five years in the same location and a full service marina to support each and every sale, the brokerage sells over one hundred boats a year. Our Brokerage is dedicated to selling our customers used boats. We handle all lines, the most popular being, Albermarle, Bertram, Bayliner, Carver, Chris Craft, Donzi, Egg Harbor, Formula, Four Winns, Grady White, Grand Banks, Hatteras, Jefferson, Jersey, Luhrs, Mainship, Marine Trader, Marinette, Maxum, Monterey, Ocean Yachts, Pacemaker, Rampage, Regal, Sea Ray, Silverton, Trojan, Uniflite, Viking, and Wellcraft. Our aggressive advertising and dedicated sales team has made Essex Marina & Boat Sales the leader in the Chesapeake Bay's used boat market. Essex Marina & Boat Sales makes buying a boat easier than buying a car. We can assist you in getting financed, insurance, surveyors,slips, and any upgrades to the boat you are buying that you may desire. Many buyers have continued to move up boat after boat with us. They know that they are getting a quality boat and the service boat buyers deserve. Our Marine facility includes a full sevice marina with a yacht club atmostphere. Our work yard and mobile service can handle all of your boating maintenance needs. We are dealers for major engines such as Yanmar diesel engines, Crusaders, Marine Power, and Mercury. We also sell all makes of generators and marine air conditioning. We are one of the largest Sealand, Vacu Flush dealers, and Intervac, Sea Vac dealers, on the Chesapeake Bay. Our Fiberglass division handles major refits down to small gel coat repairs. If you need any work done to your boat we are the people who can do it. Essex Marina & Boat Sales believes in "Service after the sale" which gives the first time boat buyers as well as seasoned boaters a very high confort level. Essex Marina & Boat Sales has been regarded as "The Place For Your Next Boat". Essex Marine & Boat Sales is located in northeast Baltimore at 1755 Hilltop Avenue, Baltimore MD 21221, just minutes from interstate 95. Her owner had her built by Egg Harbor and would fly up weekly to check on her. In 1998 he took out the Cats and installed Cummins 6CTA8.3-M3 450hp . The Cummins have about 500 hours on them, the Onan 8k gen has 100. The engine room was Imron, and is spotless. Always professional Maintained this lighty used Chesapeake bay boat is a gem.